After teaming up with Coast to giveaway one of their LED lanterns to help someone survive a blackout, I thought I better get with the program and do the same for myself. I figured what better way to build the various components of a disaster kit than to use the Bosch Click & Go L-Boxx system and the benefits that come with the modular design. 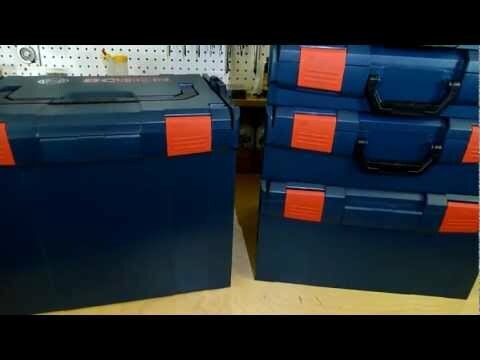 With the L-Boxx, my kit could be neatly stored as one unit but still be easily broken down for transport; and this is what sold me on using the L-Boxx to build my kit around. 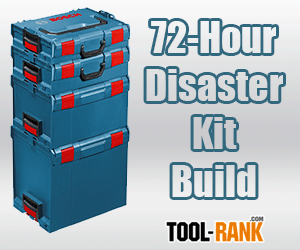 So over the next 30 days I am going to be going through the process of building my own 72-hour disaster emergency kit using the Bosch Click & Go System. I have a lot of research ahead of me, but I hope you all will jump in and provide your own advice and suggestions. Some of the basics I will have to cover are water, food, first aid, battery powered lighting, cooking supplies, tools, fire, and more. If you want to start building a 72-hour kit of your own, Ready.gov has some really good information on what you should have. You can pick up you own set of Bosch L-Boxxs from Amazon. If you are in a hurry, check out BugOutBagKit.com for Pre-made Bug Out Bag Kits. Follow the entire 72-hour Kit Build.